From initial outreach to study participation, recruiting depends upon relationships. And in a world in which nearly everyone is bombarded with marketing, personalized relationships carry more weight. That’s why data integration plays such a key role in email outreach efforts. Knowing more about potential study participants enables us to focus our efforts effectively, so we don’t overwhelm people with irrelevant content. And it helps us tailor our efforts to meet their personal needs, so they experience convenience and connection. With good data architecture you can capture a lot of information that can paint a more complete picture of an individual. It often starts with basic demographics: geography (zip code), date of birth, or year of birth, and gender, race optional. Integrating just this basic information into email, you can target effectively for a number of conditions, including qualification for age and gender, and geographic proximity to research sites. For example, our surveys show a positive relationship between geographic proximity to study sites and participation in studies. So we use zip codes and data integration to trigger emails to members when studies or sites are added within a certain distance from their home locale. These emails have a 20% clickthrough rate, and a 40% unique clickthrough for recipients who opened the email. It’s important to remember that potential participants are the only ones who produce useful data. For example, we worked with the Alzheimer’s Prevention Registry on strategies for getting people to return their GeneMatch genetic testing kits. To do this, we integrated data from kit vendors and kit processors with the basic Customer Relationship Management (CRM) data we obtained from participants when they signed up with the goal of increasing the return rate of testing kits. Once people are matched to appropriate studies, the goal is to get them to sign up. 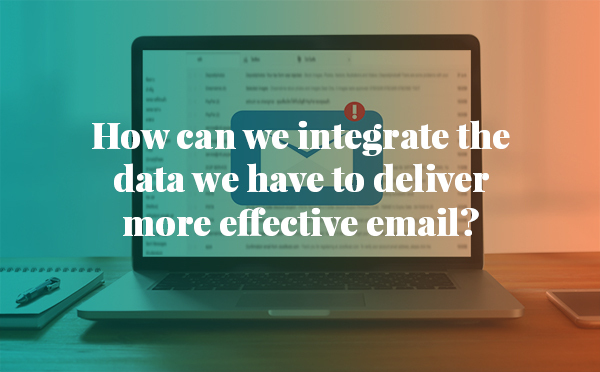 In this situation, integrated data can provide the kind of personalized information that allows email outreach to shine. In our work with the Alzheimer’s Prevention Registry, for example, we identified people who signed up for GeneMatch at a study site location. When we sent invitations to sign up for studies, we included a personal reminder that they signed up at that particular site. In addition, we know which individuals have neither responded to invitations nor unsubscribed from them. When a new study site becomes available, we are able to send a study invite to individuals who live nearby, within a specified radius, so they can choose to participate through the new site. This personalized awareness provides potential participants with useful information, not email static. Of course, the types of data you need and employ will be based upon your recruiting needs. For longstanding studies (or an anticipated series of studies) your activities will have a longer timeline. You can likely afford to gather basic demographic information, acquire other information from subscribers as the relationship grows, and build list membership over time. On the other hand, not all studies are long-term. If you are doing a single study or one with a more urgent timeline, you may need to ask for more specific information right away. In any case, it’s critical to understand the power of integrated data to improve the effectiveness of email outreach. By employing a more personalized approach to outreach, we can build productive relationships that satisfy people on both sides of the equation. And because integrated data allows us to both automate and individualize communication processes such as study opportunity emails, we make more efficient use of our time and resources as well.